Applications for the 2018 ‘Made in the UK’ concert series at Xerox Rochester International Jazz Festival are now being considered. The ‘Made in the UK’ initiative, which was started in 2008 by John Ellson and has been run since his untimely death by Sue Edwards, sponsors a British-themed showcase for American industry representatives and audiences, providing exposure for British jazz as well as covering accommodation and various expenses - full details below. The XRIJF festival takes place in upstate New York from June 22-30, and is one of the biggest music festivals in the US, attracting up to 200,000 visitors. 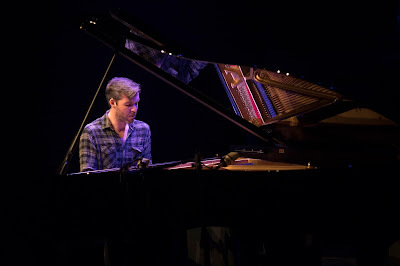 John Nugent, the festival’s artistic director and producer and a big fan of UK jazz, marks it as ‘among the most sponsored festivals in the US.’ Participants of the scheme are often also given opportunities in the Canadian jazz festival circuit, including the Montreal Jazz Festival and Toronto Jazz Festival. Applications must be from established bands who are ready to break into international markets. Past successful bands include Phronesis, Binker & Moses, Gwilym Simcock, and Laura Jurd’s Dinosaur. Musicians/bands who would like to be considered for the 2018 ‘Made in the UK’ concert series at Xerox Rochester International Jazz Festival should read the information below. ‘Made in the UK’ is an annual showcase of British jazz at Xerox Rochester International Jazz Festival (XRIJF), which takes place in late June each year. The series was founded by John Ellson (ESIP) & John Nugent (XRIJF) in 2008. Groups must be export-ready to begin or further their career in North America. The final Made in the UK 2018 programme will be chosen by the Xerox Rochester International Jazz Festival Artistic Director by early November 2017. "